Superior power and barrier penetration. A large jacket-to-core InterLock® band prevents separation, resulting in maximum weight retention and the power to punch through all FBI test barriers. New FlexLock bullet eliminates clogging and aids expansion. High-antimony lead bullet, loaded in nickel-plated case. 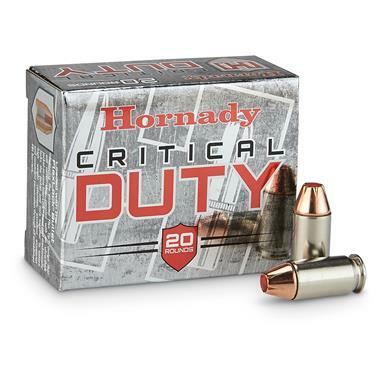 Hornady Critical Duty, .45 ACP +P, FlexLock, 220 Grain, 20 Rounds is rated 4.9 out of 5 by 41. Rated 5 out of 5 by Don Greene from Home Defense ! Hope I can keep the "bad guys" away with these rouds ! Rated 5 out of 5 by Papa Joe from Great Ammo This is the diet for my shield. Great ammo. 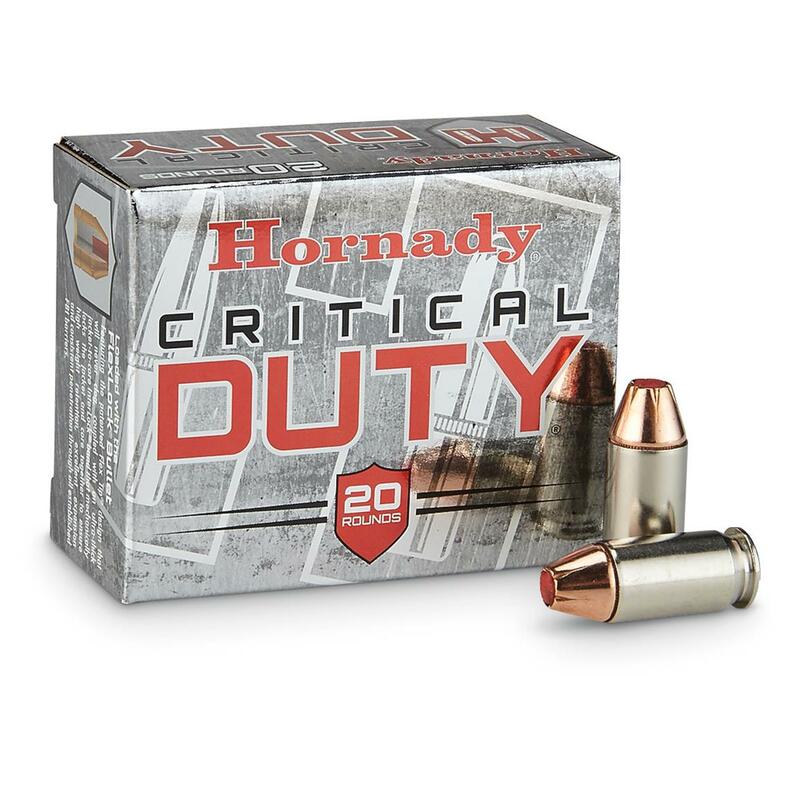 I prefer Hornady in my guns. 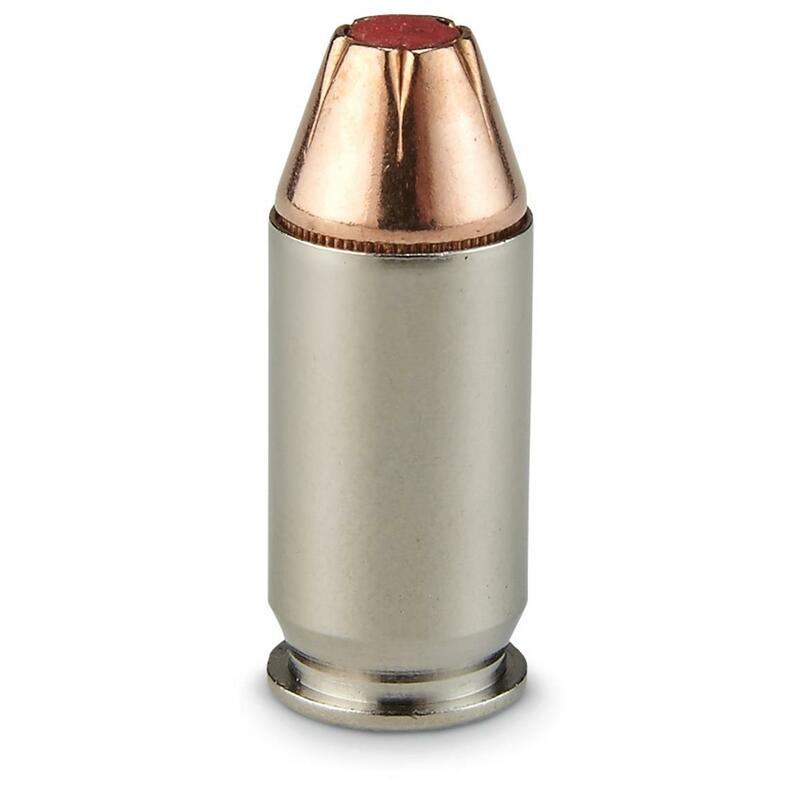 Rated 5 out of 5 by G8R8U2 from Hornady Quality & SG Prices What's not to like? These have been my .45 ACP SD rounds for 3+ years now; and I haven't seen anything come out that would change my mind since then. Rated 5 out of 5 by Don Greene from Items were as ordered with safe and secure shipping !!!! Rated 5 out of 5 by RANDY from GREAT FOR SELF DEFENSE!!! THESE ARE GREAT IF YOU CARRY A HANDGUN!! NOT FOR TARGET PRACTICE, BUT ONE OF THE BEST FOR SELF DEFENSE!! WHEN BULLET HITS, IT EXPANDS, DOING MORE DAMAGE TO WHATEVER IT HITS! !